Myo, the gesture control armband created by Kitchener-based Thalmic Labs, announced this week that its foray into presentations with an app that works with PowerPoint, Keynote, Prezi, Google Slides and Adobe Reader. This move makes the wearable move beyond controlling drones, gaming, and music events and into corporate meeting rooms. Thalmic has been selling the Myo online through its website for $199 (USD) and now the company has started its Canadian retail push by exclusively making it available through Best Buy. 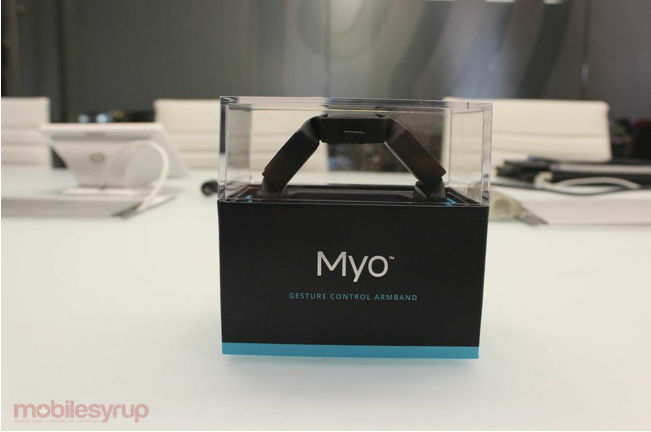 The cost is a bit higher at $249.99 with “Limited quantities available.” In addition, Thalmic noted in an email to us that “Over 50,000 Myo armbands have been shipped” to-date. Myo uses the kinetic energy and motion stored in your arm to move and execute applications on Bluetooth connected devices, be it a tablet, smartphone, computer, camera or even the Oculus Rift VR headset.